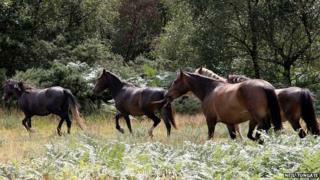 Image caption Six New Forest ponies are helping to keep the scrub and grass growth under control. Ponies and cattle have been reintroduced on to two open spaces in Hampshire for the first time in 50 years. New Milton Town Council said as well as improving habitats for plants and wildlife, the move will save money. Six New Forest ponies are grazing at Barton Common and seven Dexter cattle are at Ballard Water Meadow. Councillor Geoffrey Blunden said it will save around £3,000 a year and described the scheme as "win-win". He said: "Every year we have to cut back the grass by mechanical means. There are either one or two cuts and then all of the waste has to be taken away. "By adopting this scheme we haven't got that cost anymore. "It makes sense from a bio-diversity and wildlife point of view, but it also saves us money." Both spaces are Sites of Importance for Nature Conservation, because they are examples of heathland and grassland habitats that were once much more extensive across the UK. Angela Peters, community wildlife officer for the New Forest National Park, said the animals would help to keep the scrub and grass growth under control. She said: "As a result, a more diverse habitat will develop on this site, leading to a greater variety of dragonflies, hoverflies and wetland and heathland plants."